PASADENA, California -- While many were sleeping on the U.S. east coast, a small asteroid named 2013 LR6 passed between the Earth and the Moon last Saturday morning on June 8th at 12:42 a.m. Eastern Daylight Time. NASA said in a press release that the asteroid, which is about 30 feet (10 meters) in diameter, wasn't discovered by the space agency until June 6 by the Catalina Sky Survey. 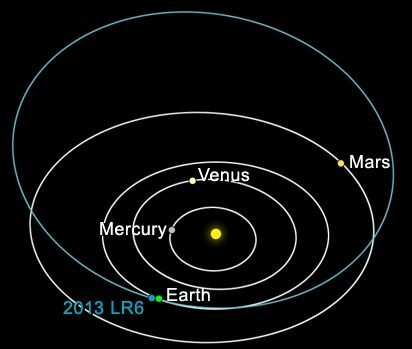 2013 LR6 made its closest approach above the Southern Ocean, south of Tasmania, at a distance of about 65,000 miles (105,000 kilometers) above Earth's surface.